I am linking up again with Farley for the new year! I am excited to see what this new year brings...so many surprises this past year! LISTENING... All I can say is I'm so glad it's not me having to take down the Christmas decorations outside. I don't know about y'all, but that is seriously the worst part about decorating. It took me over 30 minutes yesterday just to disassemble my Willow Tree Nativity Set and put everything back in the protective styrofoam. UGH! No fun, my friends. LOVING... I think all this time off is really starting to hurt my checkbook! I spent countless hours last week looking at current fashions and pinning outfits on Pinterest that I just had to have. I am bound and determined to find a more affordable way to be more fashionable day-to-day. I am fortunate in that I can pretty much wear jeans to school/work everyday, but that has created a fashion disaster in my closet. I have become a jeans and cute tops kind of gal and I need to spice it up. So after some inspiration from Cara over at Maskcara and Courtney Kerr at What Courtney Wore, I went on the ultimate shopping spree 2 days ago. Target, Ulta, DSW, Forever21, American Eagle (just to name a few), were given a major end of the year boost in sales from yours truly. I thought I would have more "after-shopping guilt" than I do. But I don't! I wonder if any teachers out there would be interested in some occasional blog posts about fashion tips, make-up ideas, etc...? Feedback?? THINKING... I could have never imagined the successes I would have on Teachers Pay Teachers this year. I know the word "blessed" is thrown around a lot lately (to the point where it kind of annoys me a little on Facebook. Sorry, but it's true...), but dare I say it?? Yes! So many of the day-to-day stresses on my family have been removed just by all of the support of each and every customer. I have been able to give more to my church each week (without feeling like it may require me to take away from another budget category) and there is the shopping spree....something I've NEVER been able to do before. WANTING... I am ok with my body, but there is just one area I would like to improve. After 2 babies, things in the mid-section just aren't the same. I found some old belts from college yesterday (15 years old, but still in good shape) and the two end barely touched when I wrapped them around my waist. How depressing. My 8 year old daughter could wear these belts (scary)! So, needless to say, my hips and belly have done some changing the past few years. I've had 2 knee surgeries in the past 7 years, so I really don't like to run and work-out like I used to. I don't eat unhealthy foods very often, so I just need a miracle solution at this point. Do any of you have that solution for me? NEEDING... My teaching partner and I were so worn out before Christmas break that we just never seemed to build up the energy to get things planned (for next week). So, here I am, all alone, having to figure out what we are going to do for our weather unit in less than a week. I want to do something new and exciting for the kids (which usually means more prep work for me), but I just haven't had that "spark"! I am envisioning some sort of rotation where the kids are doing stations in both my classroom and the other 8th grade teacher's classroom next door. I think it would be a nice change of pace for my students to be taught by the other science teacher and vice versa. He teaches 6 sections of regular science and I teach 2 sections of regular and 4 sections of Pre-AP. I totally understand how he is frustrated, worn out and at the end of his rope at the end of the day, so teaching my advanced classes might just be the motivation to keep him going for the last few months. MEMORY... 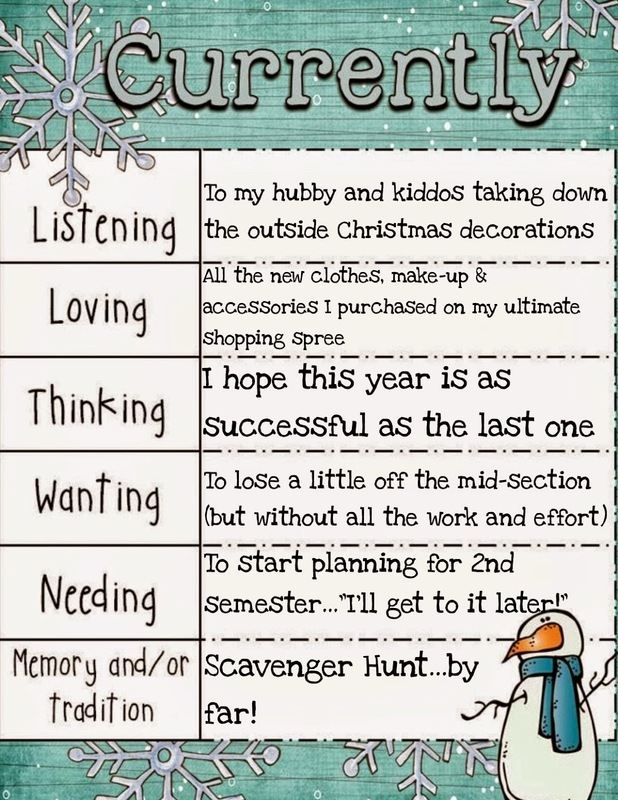 I have to say, my Christmas scavenger hunt idea was a huge hit this holiday season. I sent my brother-in-law and my 2 parents on scavenger hunts to get their gifts, instead of unwrapping them. To see my blog post about it, click here. Since we're all adults here, I'll share my favorite part. My daddy had to go on a scavenger hunt to find his Home Depot giftcard. He was so tickled by the whole idea, that he literally cracked up the entire time. When it came to the clue card the required him to take a shot of Tito's Vodka before revealing the next clue, he was a major champ and downed the whole thing in one giant chug! One thing you should know about my daddy...he's not a big drinker. He can go an entire evening sipping on one beer. So, as you can imagine, seeing him chug the vodka was quite a site for me and my family members. Definitely made some fun memories this holiday! I love your idea of the scavenger hunt! It would be so funny seeing my dad take a shot also. Sounds like your family has a lot of fun! Good luck in 2014! What a fun idea! I'll have to remember that for next year. We didn't put out nearly as many things for Christmas this year as we have in the past. The thought of putting them away was just not on my list of things I wanted to do this year. I love the idea of rotations with the other teacher.